Tsukemen (SOO•keh•men)is my favorite kind of ramen and is also some kind of cruel joke to me. I live in a great town for ramen but none of the shops nearby have the kind of tsukemen I prefer and the closest version contains a lot of shellfish. Allergies to shellfish make enjoying this difficult. Tsukemen is ramen, deconstructed. You dip the chilled noodles into a hot concentrated broth and slurp it up. Dave Chang makes it look so great at Taishoken and Rokurinsha, both amazing places to eat in Tokyo. The broth is supposed to cling to the noodles like a sloth on a dull day in the woods. It’s almost gravy…almost. It’s maddening. Add to this the dimension of ‘trickery’. Japan is not immune to image lust – neither is their food. 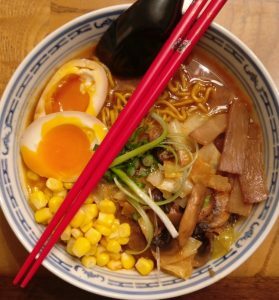 Good tonkotsu broth can take days to make or take a splash of soymilk for the color and creamy texture. Could it be a roux? Curry roux is not unknown to Japanes cooks. I have tried everything from making overconcentrated bone broth to adding vegetable starch and pectin to adding gelatin to adding flour and cornstarch as a thickener. Nothing seemed to make the tsukemen broth cling to the noodles as they did in Japan. Closest I got so far was boiling apples and cabbages in with the bones for the broth. Concentrating this broth down led to better gravy-like consistency. Then there is the element of flavor. Hot broth clinging to cold chewy noodles will require more seasoning and more care to how these flavors apply to the tastebuds. It’s easy to over salt the broth and mask all other flavors. Taishoken was a combo of smoky pork and fish with strong aromatics. Honestly I feel like I am back at the drawing board. Now that I have tonkotsu broth I am just going to go from there.